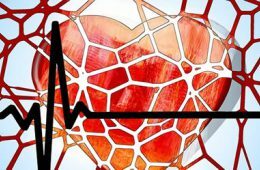 Not being aware of the pulse of our heart might prevent anxiety, EPFL scientists found. Our heart is constantly beating yet we normally do not feel it. It turns out that our brain is capable of filtering out the cardiac sensation so that it doesn’t interfere with the brain’s ability to perceive external sensations. For the first time, researchers from the Center for Neuroprosthetics at EPFL have identified this mechanism. They discovered that a certain region in the brain determines where internal and external sensations interact. Their work appears in the Journal of Neuroscience. EPFL’s neuroscientists noted that the brain perceives visual stimuli less effectively if they occur in time with the heartbeat. It seems as if the brain wants to avoid processing information that is synchronized with the body’s heartbeat. The researchers carried out an initial series of experiments with more than 150 volunteers. The volunteers were subjected to a visual stimulus – an octagonal shape flashing on a screen. When this geometric shape flashed in sync with the subject’s heartbeat, the subject had more difficulties perceiving it. The researchers just needed to figure out what was happening in the brain. They were able to show that a specific region, the insular cortex, acts as a filter and intercepts the sensations coming from the body’s beating heart. They did this by running the experiment again in an MRI scanner. When the visual stimuli were not in sync with the subject’s heartbeat, the insular cortex functioned normally and the subject perceived the flashing octagon easily. But when the stimuli occurred in time with the heart rate, the level of activity in the insular cortex dropped noticeably: the subject was less aware – or totally unaware – of the flashing shape being shown. Image Source: The image is in the public domain. Original Research: The study will appear in Journal of Neuroscience.